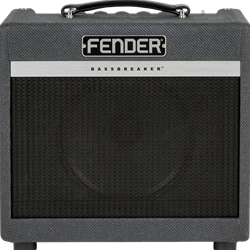 Bassbreaker series guitar amplifiers continue Fender’s storied lineage with a kind of "parallel evolution" that evokes the dawn of hard rock. Bassbreaker breaks away from tradition with features that add up to pure tube greatness. Powerful and unpretentious, the Bassbreaker 007 packs quite a punch for its size. Fueled by a pair of 12AX7 preamp tubes and a single EL84 power tube for 7 watts of true Class-A amplification, the Bassbreaker 007 features traditional gain and tone controls, and an interesting option switchable vintage-style treble booster for increased overdrive and added harmonics. Higher gain settings of the 007 are just plain fun, but never mask the dynamics and identity of the guitar. The onboard 1/4 line output connects directly to recording gear or a larger amp. Bold visual touches include block Fender logo, dark grey lacquered tweed covering, leatherette handle and big, bold pointer knobs.